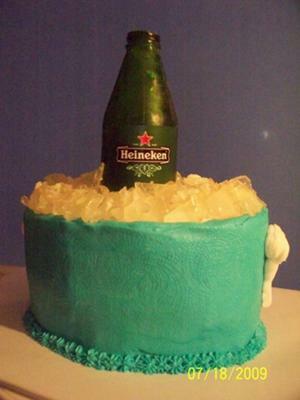 This beer bottle cake was also for an auction. I used the bottle mold I made before and had so much trouble this time. I broke at least 5 sugar bottles before I figured it out. The recipe for the bottle is 1/2 cup of corn syrup and 1/2 cup granulated sugar. Mix in glass measuring cup and microwave about 6 and 1/2 minutes. I half this for one bottle so I don't waste so much. My problem was getting the bottle out without breaking it. My mold itself kept sticking together. I had read where a lady used baby powder to keep the mold from sticking to itself but since I was using if for food, I decided to try covering the outside of the mold with cornstarch. It worked like a charm! The mold didn't stick and came off great. I only put one bottle on here because I was frustrated and had been working on 5 cakes since 7:30am and it was after midnight. The 'ice' is made of the sugar and corn syrup mixture and after it hardened I broke it with a meat hammer. I used one cake mix, according to directions, in 2 oval pans. I used buttercream in teal and white. White was for the handle on the back of the cake/cooler. I smoothed out the icing with a viva towel and after that took a cheap paper towel and imprinted the pattern of the towel into the icing. Because most coolers have a texture. It worked so well, I was impressed. I iced the top of the cake in white and stuck the bottle in the center and added the 'ice' around it. The label is made off the printer and not edible. I don't have the edible printer or ink. I bet you could, make the mold from a beer can. But I bet the sugar would be heavy. Try it and let me know.